VIGH offers traditional and online courses to Vanderbilt undergraduate seniors, medical students, nursing students, and graduate-level students in other programs, as well as Meharry Medical College students. VIGH and VUSM have developed an immersion course for third- and fourth-year medical students. The introductory overview course is a clinical rotation that also introduces students to key topics and concepts in global health including diseases, conditions, and health interventions common in low-resource settings. The course is taught through online modules and Skype mentoring sessions. Placements are at Vanderbilt partner sites in various locations around the world. All students complete a core of online modules and assessments, plus modules that are site-specific. 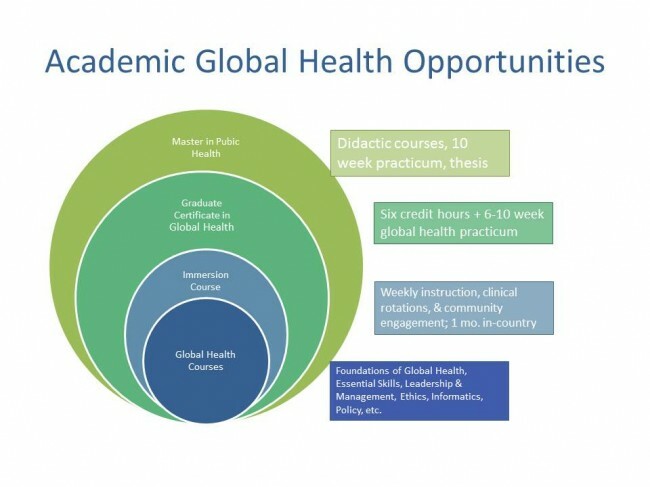 This interdisciplinary graduate-level certificate program in the study of global health is a vital step in initiating and promoting joint training opportunities in global health between various departments and schools at Vanderbilt. Students fulfilling all requirements will be granted a global health certificate at the time of graduation. MPH is a two-year program offered by Vanderbilt University School of Medicine. The primary objective of the program is to train public health scientists and professionals dedicated to improving the public health. The MPH includes didactic coursework, a practicum, and mentored research. The MPH program offers three tracks: Epidemiology, Global Health, and Health Policy. * Note: All students may access training resources here with VUnet ID and password.